KEYNOTE ADDRESS: Karmenu Vella is seen here giving the keynote address at the EMFF information day on the 9th of November 2017. The following day at the EU Oceans Action Day, Mr Vella gave a memorable speech. Karmenu Vellas is the Commissioner for Maritime affairs and Fisheries and a member of the European Commission. 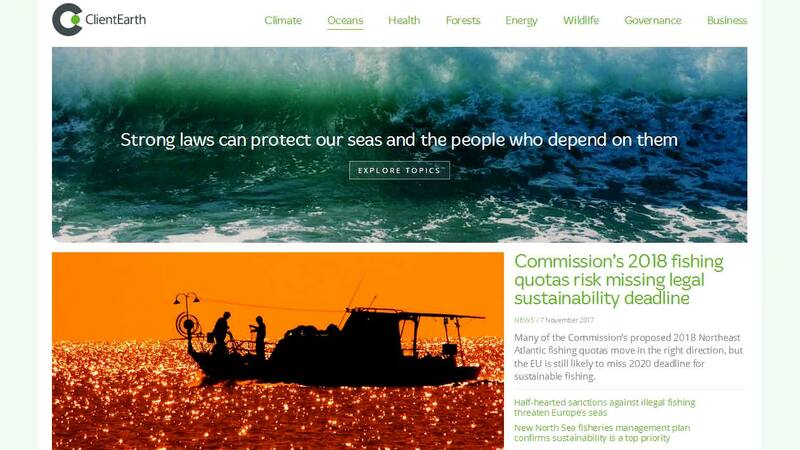 The Commissioner's portfolio includes policies such as the Common Fisheries Policy, which is largely a competence of the European Union rather than the members. The Union has 66,000 km of coastline and the largest Exclusive Economic Zone in the world, covering 25 million km². They also participate in meetings of the Agriculture and Fisheries Council (Agrifish) configuration of the Council of the European Union. 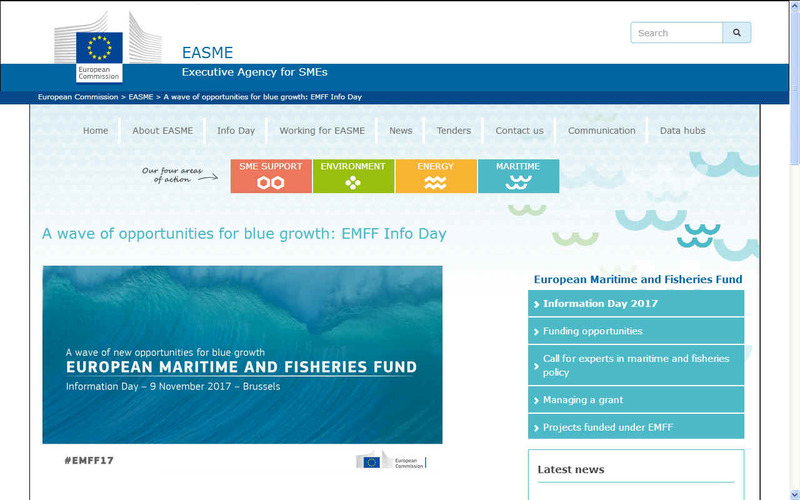 If you are looking for advice on how to get support for your innovation/demonstration project in the field of the blue economy, or perhaps are interested in marine litter or enhanced cooperation with Mediterranean third countries. Then this was the event for you. You could have learned a lot about the EMFF's new funding opportunities at their Info Day from a number of speakers. We found the information conference and networking sessions very helpful and for that reason have published our notes taken live at the event. Our man (plastic man) in Brussels reported on the day and mentions many of the contacts that he made as a volunteer, helping the Cleaner Ocean Foundation to find where funding is, and is not available. It is just as important to identify potential dead-ends to eliminate them - as it is good business sense to focus on the pots of gold; wherever they may be hidden. It all started the day before on the 9th of November, a damp and cold morning beginning with a drive to Eastbourne in Sussex at 5:00am for the 6:54 Southern train to Gatwick Airport. Booking of flights had been done in somewhat rushed fashion so that the flight schedule was not checked until it was too late to cancel. In fact, it would have been far cheaper and quicker to take the Eurostar train from London St Pancras or Ashford International. This could have reduced the travel time and the cost considerably, where travel time is wearing and so not conducive to a good event where a delegate needs to be refreshed if he is to communicate effectively, take notes, pictures and even shoot some video footage for Youtube. Of particular concern to our delegate concerning this travel schedule was the waste of good aviation fuel in flying people up and down Europe, rather than use a direct flight system. The algorithm is all wrong. The current practice to fill aircraft for the convenience of operators such as Iberia, but actually Vueling (the white planes with yellow dots), is not sustainable and is climate unfriendly. IBERIA: Leaving from Gatwick airport early in the morning for a flight to Barcelona. Why? Especially with all the difficulties Spain is experiencing at the moment. 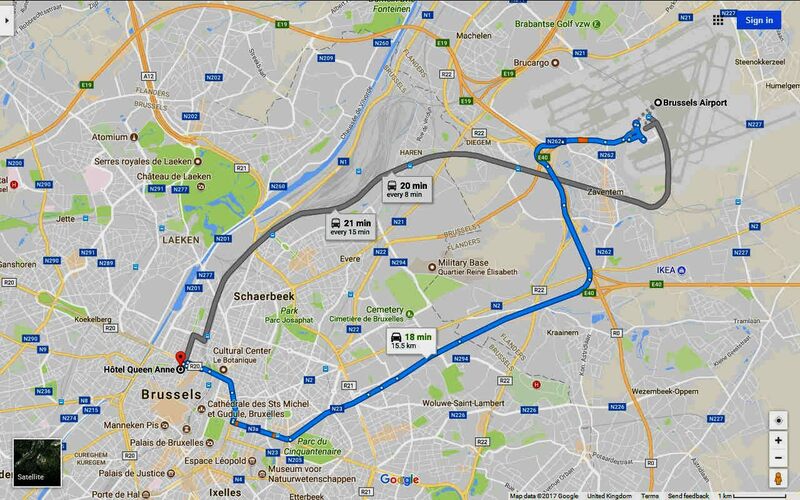 Our man in Brussels took a series of pictures to remind him to make sure to plan any networking outings more carefully. The picture above is the departure board at Gatwick, where at this stage it was just dawning on him what may lay ahead. IBERIA: Traveling is a mixture of apprehension and adventure. This picture is a view from our delegate's window seat on Wednesday morning as he set out to meet and network with other delegates at the EMFF hosted event. Looking out across the vast bed of cotton-wool clouds, that can be very attractive at times and reminds you just how magnificent the natural world is and just how small we are on planet earth. It is a very humbling experience to even the most hardened of us. The landing on this trip was as smooth as a silk pillow. 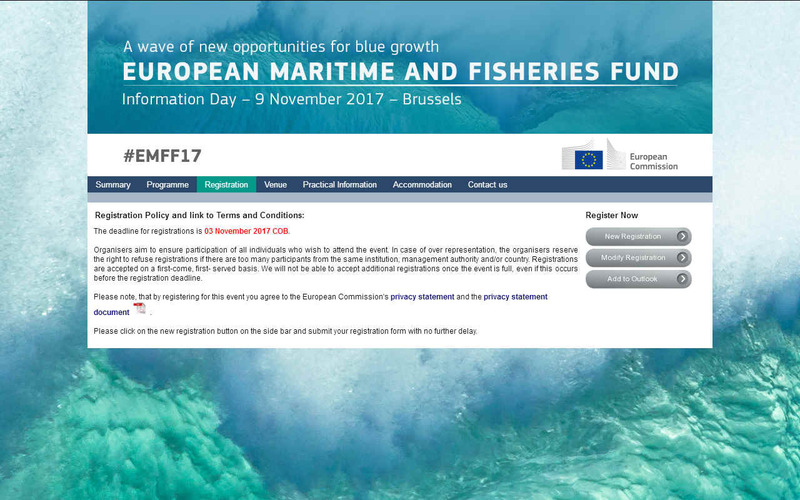 This was a new "Sustainable blue economy call" with a total budget exceeding €14 million was published under the European Maritime and Fisheries Fund at the end of October 2017. The EASME organised this information day for stakeholders interested in applying for grant funding. If you had attended, you would have had the opportunity to meet EMFF experts who were ready to answer any of your questions. The Commissioner for Environment, Maritime Affairs and Fisheries Karmenu Vella was present to give the keynote speech. 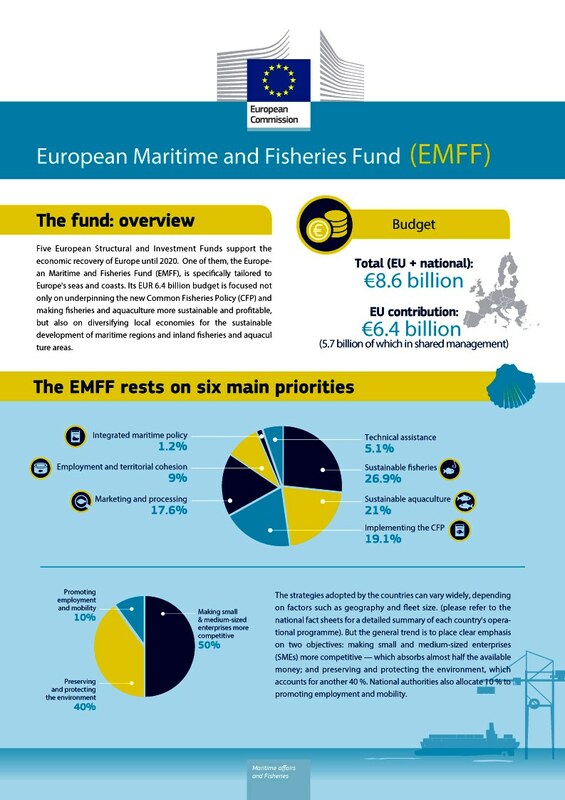 STRAND 1: Alenka Kampl came across very clearly and methodically as she explained how the EMFF were seeking to reduce the funding gap to scale up business models from blue growth concepts to fully functional systems that would benefit the blue economy. There is 8 million euros set aside to fund eight projects of 1 million euros each. The activities would include validating new systems and working with stakeholders to prepare for commercialization. The funding rate would be 65% for demonstrations. Under Strand 2, the funding rate for marine litter projects would be 80% and should last for between 2 and 3 years. COF consider this to be a step in the right direction. Insufficient for not for profit projects, but still a promising start for existing companies than can find funding for the remaining 20%. HOW TO APPLY: Victoria Beaz Hidalgo (seen in the picture above) and Charlotte Jagot spoke about some of the pitfalls that applicants fall foul of when applying for funding - and how to tick the right boxes. It is important to note what project expenses are covered and what are not, or you will lose out big-time and this may bankrupt your SME if you discover late the funding rules. These rules should be posted up loud and clear very visibly, but they are not! For example, equipment purchases are not covered whereas rentals are. You would then be a fool if you purchased equipment for any proposed project, where your company would bear the cost of new equipment. But how would you have known that? This would need more research but only if we decided that the playing field was to our liking to warrant such expenditure. QUESTIONS ANSWERED: Bernhard Friess chaired the question and answer section before the lunch break. Bernhard is the Director of Maritime Policy and the Blue Economy DG MARE. Another question posed by our man in Brussels was to do with down scoring as a result of a lack of trading track record. This question remains unanswered, we presume because it is awkward and may put off a number of potential applicants, where for the EU it is the numbers game and some kind of a scatter-gun approach. We do though live in hope that they score with this approach. MARINE LITTER: One of the most enthusiastic afternoon speakers at this conference was Claus Schultze from the DG MARE maritime innovation and marine knowledge & investment section of the European Union. He explained to the audience, a packed house of some 247 delegates that, this call was a pilot action and that it was up to the stakeholders represented by those in the audience, to provide some feedback. Claus acknowledged that desperately needed innovation "can only happen if we invest." The EU was taking this action in the hope of bridging the "financing gap," what he described as the "valley of death." The focus was on drivers and innovation. We could not agree with the speaker more. Do not go any further when considering making an application if you cannot meet the following criteria. You will be wasting your time and time is money. You will also be wasting the time of EMFF officials. These calls are all about money, gaining the funding to carry out work packages that the EU consider are important. But, they have to be sure that those receiving public money have the ability to carry out the work they are offering to undertake. You will be required to make a Declaration of Honour. This is to confirm that your company or organization is not bankrupt or insolvent. You have to be able to show stable finances and resources, such as money in the bank. This usually revolves around trading and your track record, typically with other similar projects. A. "Put in a business plan instead." That sounds plausible on the face of it, but the COF is a charity and so operates on a not-for-profit basis. If you don't exist to make a profit, we think you may agree that it is difficult to write a convincing business plan, where that presupposes making a profit. The term 'Business Plan' is open to interpretation and may mean simply to define a path to commercialization once certain stages of demonstration have been achieved. In other words charities are going to get a rough ride and might want to look elsewhere for funding. Unless, that is, that any business plan relating to a societal challenge might be acceptable if it is to cure what ails society - and perhaps there is at present no other cure. This needs further investigation and clarification. The COF is a charity that has recently taken over the running of the SeaVax project from Bluebird Marine Systems Ltd (BMS). This is because it was felt that BMS could not continue operating on a not-for-profit basis for much longer where the company structure included shares. If there are shares (in this case with no significant issue) there is always the possibility of issue and then giving dividends to shareholders by way of profit share. By nipping that potential problem in the bud, the COF might continue to operate without profits where the company structure does not include shares at all. Equally, there can only ever be an operating loss, because any monies left over would be ploughed back into follow on projects or given to another charity with similar objects. We hope that the EMFF might take this on board in future calls. Operating with a perpetual loss-making (or break-even) situation does not mean that the work packages will not be completed. Far from it. The not-for-profit impetus is more likely to succeed where those involved are not driven by profits but are involved because of the societal need. You will need to provide the CV's of all those involved in the project, together with any patents or other proprietary know how or property, and list 3 activities that you (all collaborating parties) have been involved in that are aligned with your present project proposal. This will help the assessors decide if your organization is suitably qualified to carry out the tasks they are asking for funding to accomplish. WILD FISH SHORTAGES: According to the United Nations Department of Economic and Social Affairs (UN-DESA 2009), the world population is expected to grow from the present 6.8 billion people to about 9 billion by 2050, mostly in developing countries (5.6–7.9 billion). Fisheries around the world provide significant food catches that are dwindling as a result of over-fishing and marine pollution. By tackling marine pollution, the oceans stand a better chance of regeneration, giving fish a healthier environment in which to flourish. This is where it is important to complete the relevant sections with care, noting how much of your project score is riding on each section. Clearly, the 'relevance' section should receive the most attention, followed equally by the ability to 'implement' the project and the 'impact.' Cost effectiveness is not that high a priority save that exploitation appears to stray into this territory. This means that if you were to score highly in 1. and 2. or 4. you would exceed the lowest pass rate. The success rate was quoted as being just 10% of applications. Examples were given as being that out of 75 applications in one strand 5 were approved = 6.66% granted - and in another strand out of 13 applications for EU funding resulted in 3 grants = 23% granted. That is not quite 10% in our book, but we get the picture. It is hard to obtain European funding for any proposal unless the Commission really like the look of it. All applications are said to be assessed by independent external assessors. 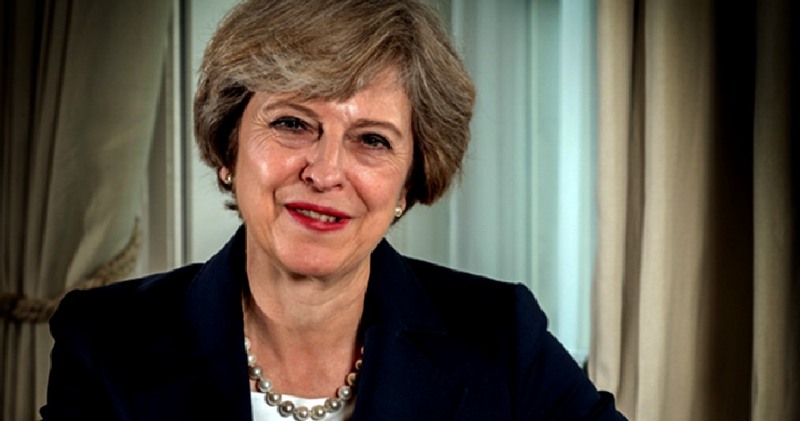 NO GUARANTEES: Theresa May, the UK Prime Minister, has so far said that she won’t guarantee anything, and that the fate of EU nationals living in the UK will depend on negotiations with Europe regarding the fate of UK nationals living elsewhere in Europe. These negotiations could take years, leaving EU nationals in the dark. She also stated that the EU concept of free movement could no longer exist in the UK. Foreign Secretary Philip Hammond is pushing for early talks with Europe regarding the status of EU nationals living in the UK and the status of UK nationals living in Europe. These talks would be held before any formal Article 50 negotiations regarding Britain’s leaving Europe. European Commission president Jean-Claude Juncker has stated that any informal discussions with the UK will not happen until after Britain officially triggers Article 50. IS BREXIT A PROBLEM ? Yes, this is a big one for any British organization looking for funding in Europe and something that cannot be ignored. The only bargaining chip is that in order for a project to succeed, that European partners may need British/English technology to have any chance of completing a work package. In other words that such inclusion is necessary for the project to proceed. Our delegate apologized for the fact that the United Kingdom had voted by a majority to leave Europe, because he was not in favor of that vote. This is his personal position and he does not speak for Blue-Growth.org even where this may be a shared opinion. We are all entitled to express our opinions as a right to freedom of speech under Articles 10 (freedom of speech, to receive and impart information) and Article 9 of the European Convention of Human Rights; the freedom of thought. Q. Will the UK leaving the EU affect any proposals from the COF? A. The answer was, "Yes. EU members will have to leave any project when they exit the EU." Let us hope then that common sense prevails, but time is fast running out for the parties to be able to hammer out the fine points of any Agreement. The COF are investing in a couple of sets of Chinese Worry Balls while all of this takes place. Strands 1 and 2 support innovation, demonstration of projects and bringing research results closer to the market. Strand 2 focuses on projects proposing concrete solutions and technologies to fight marine litter. Strand 3 and 4 aim on strengthening cooperation between Europe and the Mediterranean sea-basin to increase capacity building and support joint actions to enhance the sustainability of the sea-basin. Moreover, they support of job creation, innovation and entrepreneurship in the blue economy. For more detailed information check the extract from the amendement of the Work Programme 2017. Communication on International Ocean Governance. COF arranged for one of our volunteer engineers to attend this information day because of the implications for blue growth if marine litter is not addressed at the earliest opportunity. Our man in Brussels, a conceptual design consultant who has worked on the SeaVax concept, attended to answer questions for other delegates (potential collaborative partners) and the attending organizing officials, about the Ocean Regenerating possibilities for the blue water cruising and the smaller river variant (RiverVax) vehicles. 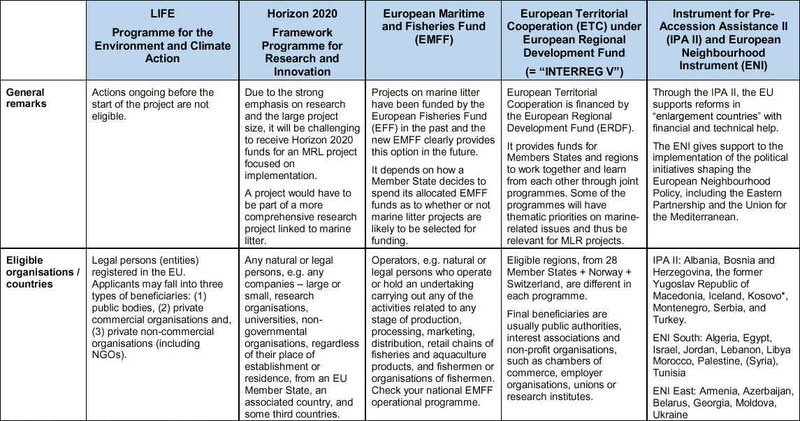 It is unlikely that COF will be applying for any EMFF grant in the immediate future where the funding rate would be 80% for SeaVax, but 100% if a health related project, clearly requiring an agenda upgrade if research projects like this are to see the light of day - except of course for future H2020 calls that may in the fullness of time, address this criteria shortcoming. In other calls when time is not so pressing, funding shortfall may be plugged with match funding, but only once the COF attains registered charity status, at present in progress in the UK. Match funding might be from charity fund raising activities like our ocean literacy competition/tour(s), where the winner of a/any round in any year attends well know events to speak about ocean plastic. Corporate sponsors might reduce their plastic footprint by supporting such a cause. Responsible corporation or generous donations from philanthropists might also be accepted to help fill the funding void. SeaVax is a €10m euro project to be spread over 3 years. A smaller pilot project was estimated to have been possible in December 2016 at €1.5m euros. This was for a craft 25% of the size of the full ocean going vessel. That estimate went into the melting pot of an EU bid managed by another consortium lead and was put on a reserved list, but in view of the shortage of funds admitted in a letter from the Commission, the smaller pilot is unlikely to see the light of day - even though scoring sufficiently to be eligible. Inflation has of course made this bid less attractive, eating into the budget. Unfortunately, SeaVax is not a health related project or it would receive 100% funding, it is a food security concept and being a project adopted by the Cleaner Ocean Foundation, would not in any event be eligible under the Small to Medium Enterprise scheme (SME) instrument. This is though an opportunity to see how things work in Brussels and network with other delegates in the hope of finding possible collaborative partners for future Horizon 2020 calls that may up the importance of cleaner seas as may benefit food security in the long term. We have included a number of organizations below that our man in Brussels spoke with (not all due to limited resources) - and with whom there is the potential to work with and meet the above criteria. 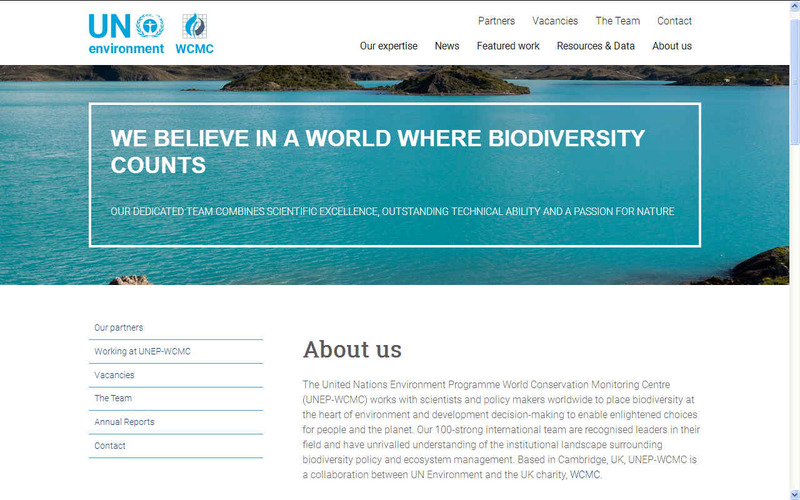 UN-WCMC: The United Nations Environment Programme World Conservation Monitoring Centre works with scientists and policy makers worldwide to place biodiversity at the heart of environment and development decision-making to enable enlightened choices for people and the planet. Our 100-strong international team are recognised leaders in their field and have unrivalled understanding of the institutional landscape surrounding biodiversity policy and ecosystem management. Based in Cambridge, UK, UNEP-WCMC is a collaboration between UN Environment and the UK charity, WCMC. Our man in Brussels spoke with Hazel Thornton (Marine Programme Officer) at this event, about marine litter when potential SeaVax capabilities were discussed in the context of protecting marine life. Hazel provides technical support to a range of projects and activities in their Marine Programme, contributing to research and analysis elements with a primary focus on digital products. Prior to this, Hazel’s previous role in the Species Programme focussed on species-related Conventions and Agreements, such as the Convention on International Trade in Endangered Species of Wild Fauna and Flora (CITES), the EU Wildlife Trade Regulations, and the Convention on Migratory Species (CMS). As part of the Proteus Partnership project, Hazel contributes to the development of the Ocean Data Viewer and the management and distribution of high-quality marine and coastal data. 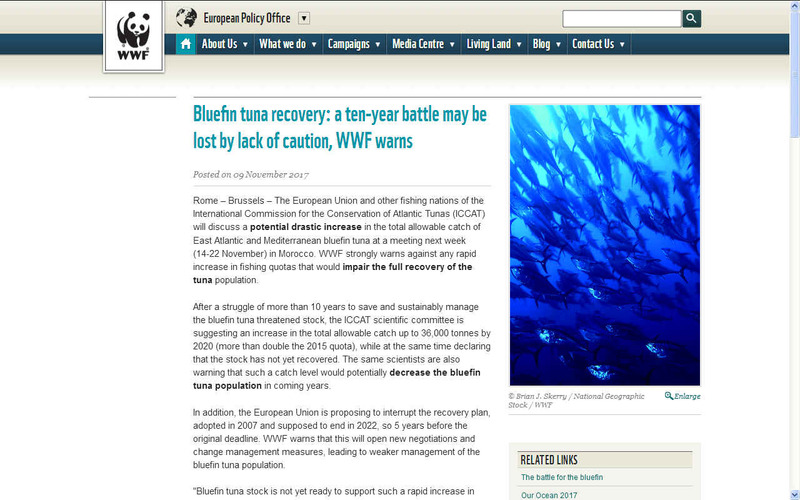 WWF: According to the WWF, Europe’s seas remain in a critical state with most fish stocks heavily overfished, too many pollutants, biodiversity loss, degraded habitats, invasive species and declining coastal communities. Despite having good legislative tools, such as Marine Strategy Framework Directive, Marine Spatial Planning Directive and the Integrated Maritime Policy, the EU probably won’t achieve its ambition of sustainable use of European Seas. To deliver good environmental status these legislative tools need to meet sustainability targets, including sustainably managed fisheries and established marine spatial plans by 2020 and 2021. Sustainable Development Goal 14: on ‘Life Below Water’ has raised ocean conservation and ocean governance issues onto the international agenda. To successfully implement the targets within the SDG 2030 agenda there, the EU needs to address the budget deficit of 3 trillion USD between the public money available and the estimated cost to ‘leave no one behind’. WWF is working with Member States to ensure environmental coherence in marine spatial plans as well as with the Commission and private sector to develop a set of guidelines and ‘guardrails’ to influence investment decisions and development policy within the maritime sector along the most sustainable blue economy pathways possible. The EU should make sure it achieves the good environmental status (GES) and sustainable management of fish stocks by 2020. Our man in Brussels spoke with Margherita Solca (Senior EU Development Policy & Funding Officer) at this event, about marine litter and the role that ocean regenerating systems like SeaVax and SeaNet could play in helping marine life enjoy a healthier ocean. MISSION STATEMENT: The mission of The Nature Conservancy is to conserve the lands and waters on which all life depends. Their vision is a world where the diversity of life thrives, and people act to conserve nature for its own sake and its ability to fulfill human needs and enrich our lives. The Nature Conservancy operate through the dedicated efforts of diverse staff, including more than 600 scientists, all of whom impact conservation in 72 countries. Their many partners include individuals and governments to local nonprofits and corporations. By using a non-confrontational, collaborative approach and staying true to our five unique core values. With this approach The Nature Conservancy claims to have done more than anyone else to advance conservation around the world since their founding in 1951. Our man in Brussels met Marta Marrero Martin (Ocean Governance Director - Global Ocean) at this event when they shared information about the role of The Nature Conservancy and how SeaVax might recover plastic (marine litter) from the oceans. UK Office: 26-28 Ely Place, London, EC1N, UK. IRIDIUM: Powered by a uniquely sophisticated global constellation of 66 cross-linked Low Earth Orbit (LEO) satellites, the Iridium® network provides high-quality voice and data connections over the planet’s entire surface, including across oceans, airways and polar regions..
Iridium is constantly looking for new ways to expand possibilities, including their next-generation constellation, Iridium NEXT. Anticipated to complete deployment in 2018, Iridium NEXT will enable a superior platform to support Iridium’s partners and bring enhanced and innovative new services and capabilities to our customers, such as Iridium Certus. Expected to be available in 2017, Iridium Certus will enable enterprise-grade satellite broadband communications across a variety of industries, revolutionizing the way businesses operate and communicate. 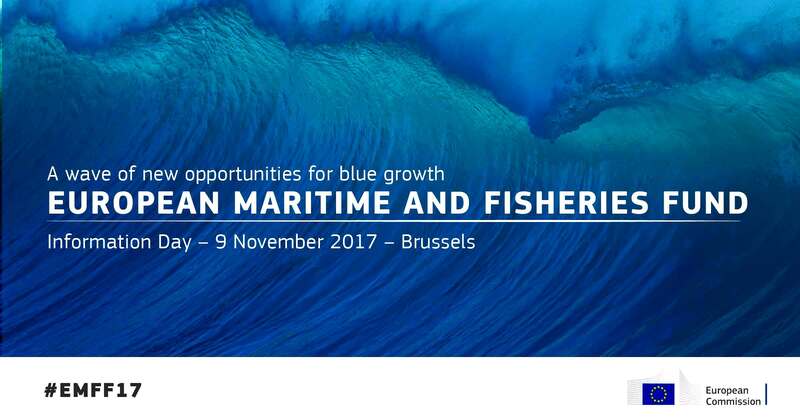 Our delegate in Brussels spoke with Wouter Deknopper (Vice President & General Manager, Maritime Business) at this event. 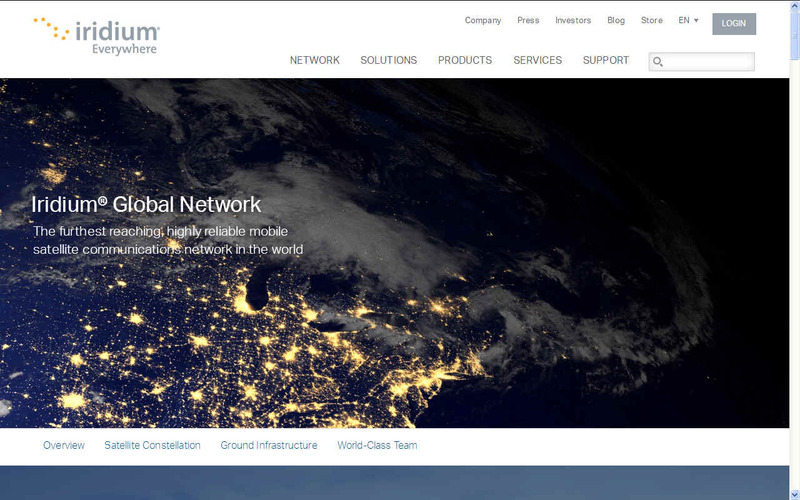 Of particular interest was the low latency satellite coverage in connection with SeaVax global ocean cleaning operations. SATELLITE MONITORING: CLS employs 650 people at its headquarters in Toulouse and on 25 other sites around the world. The company works in six strategic areas of activity: sustainable fisheries management, environmental monitoring, maritime surveillance, fleet management, energy & mining, space & ground systems. CLS process environmental data and positions, ocean and inland waters observations. In addition, CLS monitor land and sea activities by satellite. CLS, a subsidiary of CNES, ARDIAN & IFREMER, is a worldwide company and pioneer provider of monitoring and surveillance solutions for the Earth since 1986. Our man in Brussels met with Etienne Klein to touch base on the possibilities of using satellites for SeaVax in the fight against marine litter. JPI OCEANS: The Joint Programming Initiative Healthy and Productive Seas and Oceans (JPI Oceans) is established in 2011 as an intergovernmental platform, open to all EU Member States and Associated Countries who invest in marine and maritime research. JPI Oceans covers all European sea basins with 21 participating countries and provides a long-term integrated approach to marine and maritime research and technology development in Europe. JPI's delegate at this event was Anders Brudevoll. Our man in Brussels touched base with him to find out more about their research. ADVOCATES: Client Earth work to protect the environment through advocacy, litigation and science. They base their strategic decisions on the best research and policy analysis, acting on legal opportunities – whether influencing decision-makers or in court. Client Earth focus on access to the European Court of Justice as its decisions completely bar use of the court by NGOs, except in relation to cases involving documents. This means that no NGO has been granted the right to challenge any decisions from EU institutions. In the UK, access to justice costs are prohibitively expensive – which deters individuals and many organizations from challenging decisions before the courts. Improving citizens’ access to justice is a long term challenge. For this organization, environmental democracy is the key that will empower all citizens to hold decision-makers to account. Rachel Prescott-Smith (MA Practical Ethics, Bioethics, Environment & Law - Development Officer) explained some of the work that this group do to our delegate. The COF wish them well and wonder why nobody has been prosecuted for dumping plastic in our oceans when marine law prohibits such pollution. If there was any possibility of lobbying to identify the worst offenders, and/or tag plastics for identification purposes, that might at least reduce the task that SeaVax may face in the years to come. RESOURCE MANAGEMENT: MRAG has a history of designing and implementing integrated resource management systems in marine, estuarine, riverine and floodplain environments. They have a core staff of more than 30 full time specialists with a wide variety of expertise and practical and technical experience, providing a multi-disciplinary approach to every project. 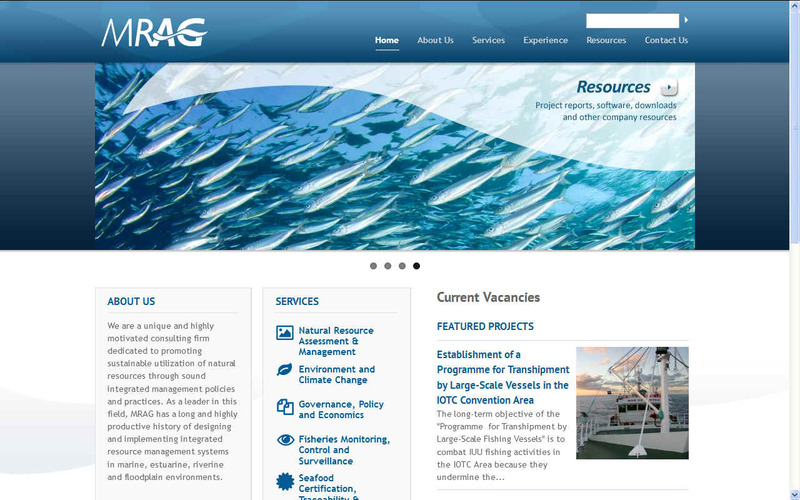 For over a decade, MRAG has worked in more than 60 countries for government agencies, including the US National Marine Fisheries Service and National Academy of Sciences; UK Department for International Development (DFID) and Foreign and Commonwealth Office; international agencies including the World Bank, United Nations Development Program; European Commission; non-governmental organizations; and private sector companies. Our delegate spoke with Dr Robert Wakeford about the services that MRAG provide for the possibility of alignment with SeaVax and the present EMFF calls. FUND RAISING: If you are in search of funding for a project that brings the world closer to a sustainable society then this organization may be able to help. This is one of the main reasons why Ocean Impact Alliance was founded. 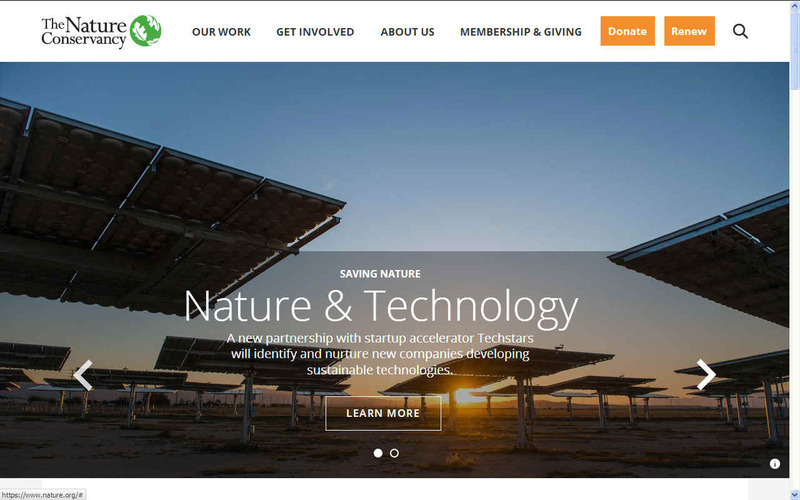 Their stated objective is to find as many fundable eco-projects as possible. If your eco-friendly project is at an advanced stage, then these guys may be able to connect you to the relevant capital provider. 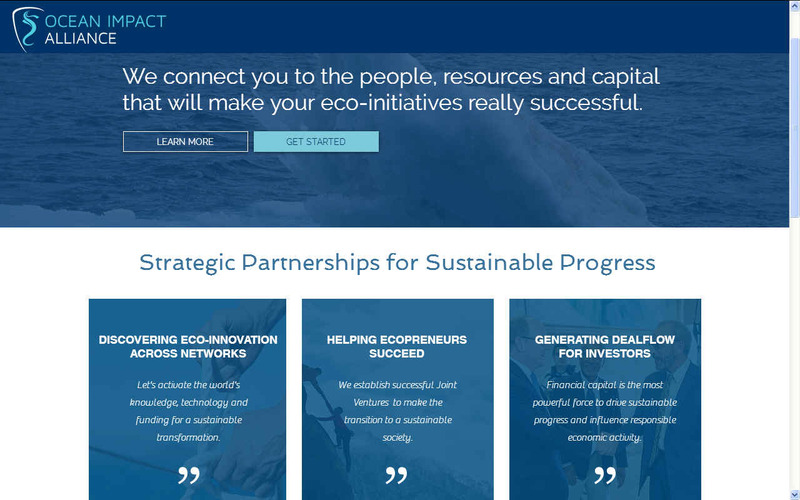 I you are not yet ready for commercial funding the Ocean Impact Alliance could connect you to a fundraising expert. Our man in Brussels met Lef Winckelmans (Ecopreneur) and Peter Royers (Executive Assistant) at this event when they shared information about their projects with an emphasis on marine plastic waste and the potential for SeaVax as an ocean cleaning tool. NETWORKING - Skirmanta Treinyte, Nelson Kay and Dylan Howell took the opportunity to speak more of the event and possible ways forward with their various projects. They are pictured here at a restaurant in Brussels city centre having first endured a chilly outing with a bigger group of delegates at an outside cafe venue. Skirmanta Treinyte (Good Fish Foundation) is a junior specialist in Marine Governance with a special focus on EU fisheries and aquaculture. Skirmanta has experience in project drafting and international stakeholder involvement. The Good Fish Guide Foundation (GFF) is a relatively new organisation, founded in June 2014. They manage and develop the VISwijzer (Seafood Guide) and will upgrade the tool to accommodate emerging sustainability issues such as traceability, fair trade and illegal practices in the seafood sector. The Good Fish Foundation hopes to work alongside European businesses to accelerate the transition towards a sustainable seafood supply chain. This is a worthwhile and in our opinion a very necessary service. Dylan is an Aquaculture Masters Candidate at Ghent University, a public research university located in Ghent, Belgium. He previously worked with the National Aquaculture Group (NAQUA). The National Aquaculture Group (NAQUA) is one of the largest aquaculture operations of its type in the world and offers you the opportunity to enjoy products grown in their farms strategically located by the coast of the Red Sea in Saudi Arabia, 180 kilometers south of the historic port of Jeddah, close to the town of Al Leith. Aquaculture has a potentially great future if feed can be produced in a sustainable manner, such as the Australian Government have identified with their blue economy challenge. This was also one of the topics in a recent brokerage day in London, where breeding fly larvae in large quantities presents a possible breakthrough, creating quite a buzz. Nelson is a hands on design engineer and a qualified CAD jockey. He is also a time served welder/fabricator skilled in constructing vehicles from scratch in steel, aluminium and composites - and a BSAC sub aqua diver - though he is getting on a bit and dives infrequently these days. He also makes proof of concept (robotic) models and is an inspirational public speaker when the occasion demands. Nelson constructed the SeaVax model @ 1/20th scale, in the process showing his project partners how to fabricate free of conventional constraints and so building their skill base and free thinking ability. This is important when innovation and flexibility is the key to overcoming potential problems on any new concept vehicle. Nelson is a consultant to the Cleaner Ocean project on legal issues such as patents and trademarks with a solid track record of obtaining protection or permissions for his clients at low cost. His advice on ocean cleaning strategy is free to anyone via email and he regularly contributes to these articles when technical issues arise. 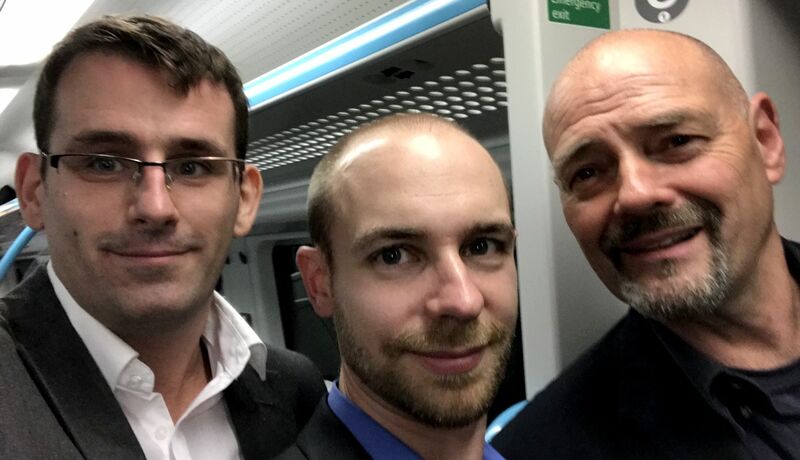 CHRIS, RICHARD & NELSON - The Three Musketeers returning from the UK KTN H2020 brokerage event in London 31-10-17. This event was in connection with food security as land based agriculture and marine based innovation. Chris is a gas engineer knowledgeable about fluid handling & filtration and Richard (Ex RAF) is the team's logistics and procurement expert. The venue was the Borschette Conference Center, Rue Froissart 36, Brussels. The facilities were superb in that every delegate had access to a microphone and a comfortable seat. The projectors spotlighted the presenters on stage, and during question and answer sessions; the delegate asking the question. The lighting was spot on; not too glaring and the room temperature was just right for delegates to feel comfortable. During the breaks, coffee, orange juice and water were flowing freely. Lunch was simple, but more than adequate where networking used up most of the eating time anyway. One small comment on the arrangement, was that the seating could not be changed by the organizers, meaning that the delegates had to turn their chairs and then still turn their heads to look at the speakers. You could argue that it is not necessary to see the speakers, but you miss a lot of body language and the feel of real communication if you cannot interact effectively. BRUSSELS AIRPORT ROUND TRIP - Getting to and from his hotel was best accomplished by taxi where our man in Brussels was unfamiliar with the public transport system in Belgium. He will though test the water on other trips. The taxi took around 20 minutes from the terminal to the foyer at the Queen Anne Hotel. The Queen Anne Hotel was a budget affair, more than sufficient for resting our delegate, though the bathroom light didn't work, meaning that there could be no privacy when taking showers. Fortunately, he was traveling alone. HOTEL TO CONFERENCE CENTRE - Even with the Metro as a possible travel option, getting to and from his hotel was quicker by taxi. Only one taxi driver did not knew where the Queen Anne Hotel was. 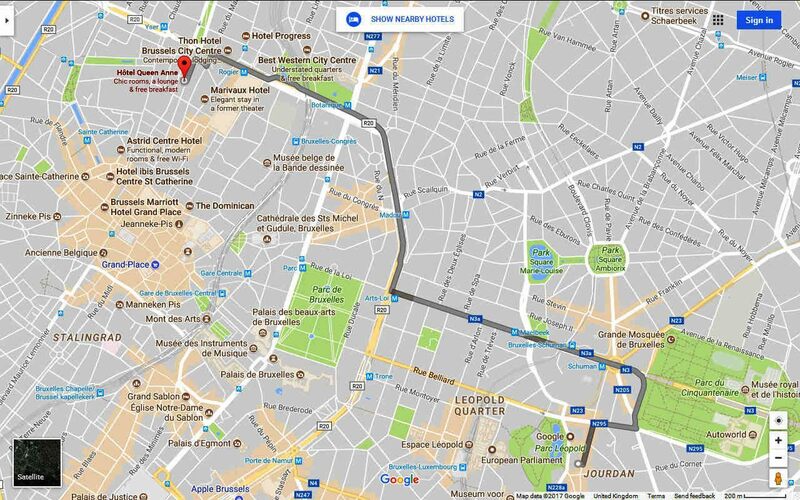 Fortunately, our man in Brussels had printed out a couple of maps from Google to show him the way. CONFERENCE CENTRE - Albert Borschette (14 June 1920 – 8 December 1976) was a Luxembourgian diplomat and writer. He served as Luxembourg's European Commissioner from 1970 until 1976. After attending the Lycées of Diekirch and Luxembourg City, Borschette studied in Aix-en-Provence, Innsbruck, Munich and Paris. In World War II he was forcibly enrolled in the Wehrmacht, and fought on the Eastern front. His experiences there became part of his literary work: almost all of his books involve the Soviet Union or the war. For his novel Continuer à mourir he received the SELF Prize in 1957. After the war he was a press attaché in the Ministry of State, and then became the Luxembourgish representative with the French occupying army in Germany, with the Allied Control Commission in Berlin, then Embassy Secretary in Berlin and then in Brussels. His work in and for Europe was aimed at making another war on the continent impossible (one of his books mentions the "génération sacrifiée", the lost generation). From 1958 to 1970 he was the Permanent Representative of Luxembourg to the European Communities, later the European Union. From 1970 to 1976 he was a member of the European Commission with responsibility for competition, under the presidencies of Franco Maria Malfatti, Sicco Mansholt and François-Xavier Ortoli. His tenure saw the break-up of the sugar cartel. From 1970 to 1973, he was also the Commissioner for regional policy and the budget. BRUSSELS - The City of Brussels (French: Ville de Bruxelles [vil də bʁysɛl] or alternatively Bruxelles-Ville [bʁysɛl vil], Dutch: Stad Brussel [stɑd ˈbrɵsəl] or Brussel-Stad) is the largest municipality and historical centre of the Brussels-Capital Region, and the de jure capital of Belgium. Besides the strict centre, it also covers the immediate northern outskirts where it borders municipalities in Flanders. 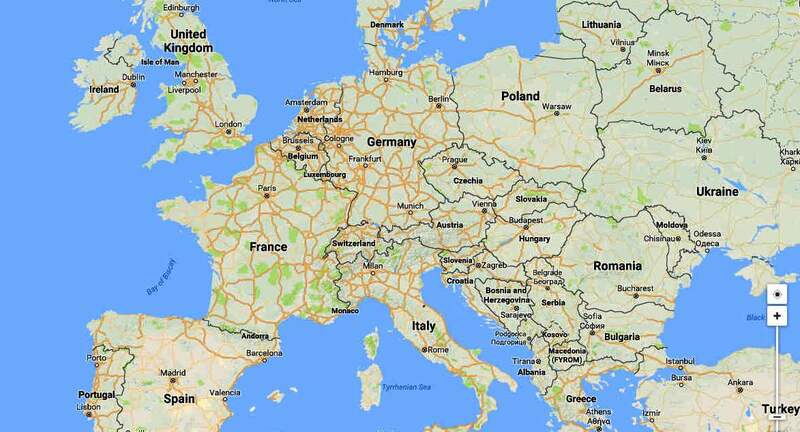 It is the administrative centre of the European Union, thus often dubbed, along with the region, EU's capital city. ARCHITECTURE - The City of Brussels is a municipality consisting of the central historic town and certain additional areas within the greater Brussels-Capital Region, namely Haren, Laeken and Neder-Over-Heembeek to the north, and Avenue Louise/Louizalaan and the Bois de la Cambre/Ter Kamerenbos park to the south. On 1 January 2016, the City of Brussels had a total population of 178,552. The total area is 32.61 km2 (12.59 sq mi) which gives a population density of 5,475 inhabitants per square kilometre (14,180/sq mi). As of 2007, there were approximately 50,000 registered non-Belgians in the City of Brussels. BELGIUM - The Kingdom of Belgium, is a sovereign state in Western Europe bordered by France, the Netherlands, Germany, Luxembourg, and the North Sea. It is a small, densely populated country which covers an area of 30,528 square kilometres (11,787 sq mi) and has a population of about 11 million people. Straddling the cultural boundary between Germanic and Latin Europe, Belgium is home to two main linguistic groups: the Dutch-speaking, mostly Flemish community, which constitutes about 59 percent of the population, and the French-speaking, mostly Walloon population, which comprises about 40 percent of all Belgians. Additionally, there is a small ~1 percent group of German speakers who live in the East Cantons. All too soon it was time to hop back onto a jet and fly home. The taxi to the airport was excellent. The driver did not pull any punches and was rewarded for his quality driving. Once again those pesky flight operators put our man through the mill with two flights, one to Prague and then another to Gatwick to get home. Would you believe that there were two flights from Prague to Gatwick at the same time - and yes - our man went through security at the wrong terminal before realizing that there was an Easyjet plane where there should have been one from Czech airlines. The staff were most accommodating and managed not to laugh. Our man did. This time the transfer was not so long winded, but the flight home via Czech Airlines was interesting to say the least. The take off from Brussels was smooth and typical. The take off from Prague involved way more time to lift-off where the flight was completely full and the jet struggled. Our man got the impression that the aircraft had seen better days. The landing was even more interesting. The plane seemed to just drop from the sky with a crash and veered left and right as if there was too much play in the steering linkages. Wow! Gatwick being damp and misty did not help the feeling that the aircraft might have flipped in the mechanicals were any more worn. On his return our delegate got straight back to work, that is after a decent meal, a good night's rest and getting back into a routine with food and beverages that he is used to. You simply cannot get a decent cup of tea in Brussels. It's all coffee and juices. The breakfasts too left one feeling as though something was missing. This is from a man who does not eat breakfast, just imbibes tea and coffee until midday, when a snack is a must. For the COF the event was a resounding success. We learned a great deal from the speakers, practical tips, though repeated many times during the day - as some of the criteria are applied to every strand. The networking sessions were also productive. Our delegate managed to speak to just about all of the EU officers on a one-to-one basis, save for Bernhard Friess and Karmenu Vella. That is hardly surprising given the schedule of these two men. Most of all the policy officers were approachable and helpful where they could be. So a big thank you from the COF to all of those involved in putting together this memorable event. THE RETURN LEG - This was a view from one of the departure lounges as our delegate walked his way to a waiting jet along the glass lined corridors. Take some comfortable walking shoes when you travel by air and make sure that your cabin baggage is of the lightweight variety with a good set of wheels attached. The landing at Gatwick airport was one of the roughest you could imagine - on a slippery runway - now that sets the heart racing as our man in Brussels raced through passport control to catch the train home to a waiting VW Golf, the workhorse of the COF's vehicles. The other VW in our stable is an air cooled Combi Van, that is being restored and converted to tour the UK and inform the public about ocean plastic waste. We also run an electric BMW i3 that is superb for low-carbon film and other PR work where it is nice to be able to demonstrate near zero-carbon motoring. THE RETURN LEG - One of the Czech Airlines A319 Airbus jets that made the ride home a bit more Indiana Jones. Our man in Brussels would rather have flown home on a Douglas Dakota (DC10). At least the ham and cheese sandwich was reasonably fresh and the pilots did not bail out over the English Channel. Established in 1923 Czech Airlines are one of the five oldest in the world. They are founder members of the International Air Transport Association (IATA) and have been a member of a global alliance of air carriers, the SkyTeam Alliance, since 2001. EURO RECYCLING: Our man in Brussels was pleased to note that in every airport that they were taking the separation and recycling of travelers waste seriously. Even the fast food chains abroad had adopted a similar scheme. McDonalds being one of those. Well done on this. The famous burger chain also provided our delegate with a very tasty strawberry smoothie that had a really fresh tang, pulp, pips and all. The fruit, the whole fruit and perhaps just a bit of titivating? We'll never know. 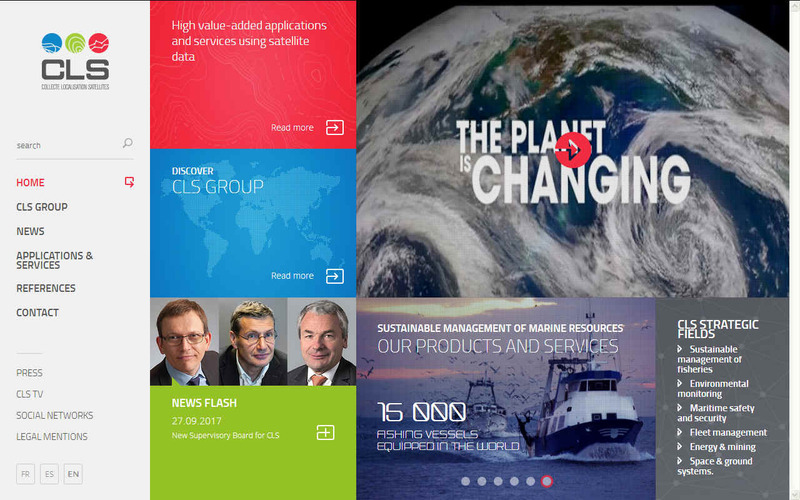 GLOBAL OCEAN OBSERVATION - EuroGOOS identifies priorities, enhances cooperation and promotes the benefits of operational oceanography to ensure sustained observations are made in Europe’s seas underpinning a suite of fit-for-purpose products and services for marine and maritime end-users. 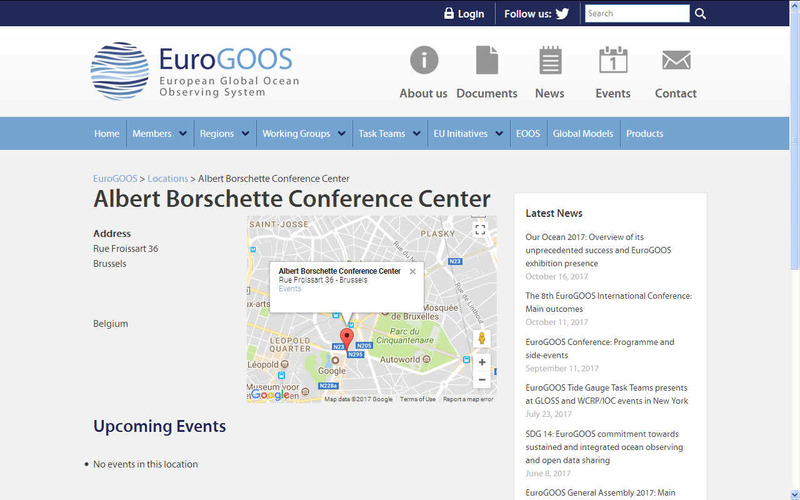 EuroGOOS is a pan-European network operating within the Global Ocean Observing System of the Intergovernmental Oceanographic Commission of UNESCO (IOC GOOS). EuroGOOS is registered as an international non-profit association under Belgian law (EuroGOOS AISBL) and its Secretariat is located in Brussels. SUSTAINABLE FISHING: The production of caught wild fish is close to the maximum ecosystem productivity (NRC 2006), cannot be increased substantially with present pollution levels in the future and could decline if not properly managed, leaving the world to solve a significant new food deficit. The Mediterranean Sea is an ideal proving ground for innovative technology that may be produced to tackle marine pollution. SUSTAINABILITY: When you consider the size of the Mediterranean Sea, €14 million euros may not seem like much to be able to tackle the problem of marine litter and this has been the view of the assessors, or rather applications in respect of Horizon 2020 calls have not been funded because of budgetary constraints, though considered to have merit. What is likely to happen as a result of budget shortfalls is that project proposals will need to be curtailed such as to qualify - to at least keep the technology ball rolling. Alternatively, entrepreneurs and research establishments may take the view that such endeavors aught be put on the back burner until such time as marine litter becomes recognised for the blocker in sustainability terms that it is. This website is provided on a free basis as a public information service. copyright © Cleaner Oceans Foundation Ltd (COFL) (Company No: 4674774) November 2017. Solar Studios, BN271RF, United Kingdom. COFL is a charity without share capital. The names AmphiMax™, RiverVax™ and SeaVax™ are trade names used under license by COF in connection with their 'Feed The World' ocean cleaning sustainability campaign.